You will have a full day game drive in Masai Mara. Packed morning breakfast & afternoon packed lunch will be served during the game drive. Here you have an opportunity to experience fascinating ‘Balloon Safari’ (Optional at additional cost). Here, black rhino browse among dense thorn bushes and herds of giraffe and elephant roam the woodlands. Nestled under canvas, tonight you’ll dream of all the wonders of Africa. Stay at Keekorok lodge (Full board – Breakfast, Lunch, Dinner). You will have early morning game drive in Masai Mara. Packed morning breakfast will be served during the game drive. 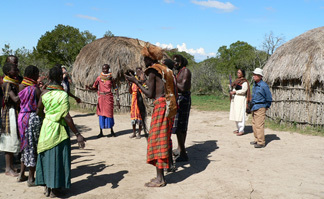 In afternoon you can visit Masai village to see the tribe and their activities (Optional tour) The Masai Mara is the northern-most extremity of the great Serengeti ecosystem. Here, black rhino browse among dense thorn bushes and herds of giraffe and elephant roam the woodlands. Nestled under canvas, tonight you’ll dream of all the wonders of Africa. Stay at Keekorok lodge (Full board – Breakfast, Lunch, Dinner). After breakfast start your return journey to Nairobi. Reach for Lunch. After lunch proceed for half day city tour some shopping etc and then to Air Port for return flight.